The security posture that companies have adopted has been typically focused on the prevention of known attacks. This approach has failed to actually secure enterprises! In this world, “proactive security” means erecting more and more security “walls” on the enterprise’s perimeter and waiting for an attack to happen. The numerous breaches that enterprises of all sizes report on a regular basis are the evidence of such failure. Billions of dollars of investments in old-style, perimeter-focused security have failed to stop cyber attackers from successfully stealing valuable information from organizations globally. Enterprises need to realize that they should change their ways. 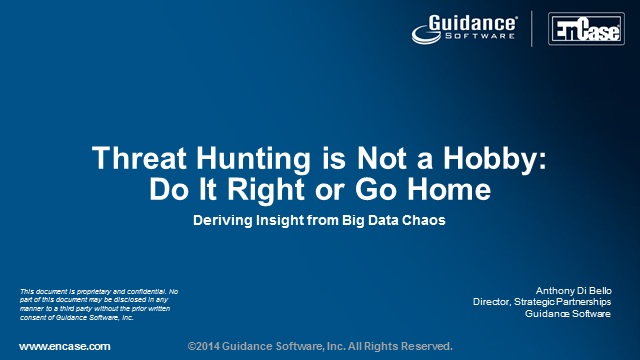 They need to go hunting – threat hunting. This threat hunting cannot be an ancillary or optional function that the Security team conducts. Instead, cyber threat hunting needs to be conducted systematically and programmatically. In this webinar we will review the steps that an enterprise needs to take to become an effective threat hunter including processes, skills, and technology.